There are times when it makes sense for a large company to work with a startup. 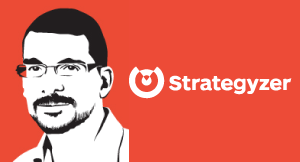 Alex Osterwalder recommends that a large company think of the relationship as a partnership, even when the large company is investing money into the startup. The startup is autonomous but could vastly benefit with access to some of the larger company's other assets such as brand, relationships, or IP. So sometimes there are things you can't do internally because of the culture, because of the processes or because of the brand for example. So I do think you know it does make sense for large companies to sometimes say, well what if we use an external entity and gave them you know the entire freedom, invest maybe in them and then potentially acquire them. The one problem with that approach is that the start-up might lose some of the things that the large company could normally offer which is brand, which is access to its sales force. So working with start-ups is really good if you can also help them benefit from some of the assets that you have, and I don’t just mean money I mean sales force, I mean brand, IP and so on. So you know turning it into more of a partnership where you can give them some of your strengths to leverage you know where they are starting out, that’s when you get the best kind of results.